Figure 260. Power house replica, Johnson, VT.
World Guide to Covered Bridges, B. Heisel, ed., The National Society for the Preservation of Covered Bridges, Inc., 1989. Standard Specifications for Highway Bridges, the American Association of State Highway and Transportation Officials (AASHTO), 17th Edition, 2002. National Design Specifications for Wood Construction and Supplement: Design Values for Word Construction, American Forest and Paper Association, 2001. Ritter, Michael, Timber Bridges-Design, Construction, Inspection, and Maintenance, U.S. Department of Agriculture, U.S. Forest Service, 1992. James, J.G., "The Evolution of Wooden Bridge Trusses to 1850," Journal of the Institute of Wood Science, United Kingdom, Vol. 9, Nos. 3 & 4, Issues 51 & 52, June and December 1982. 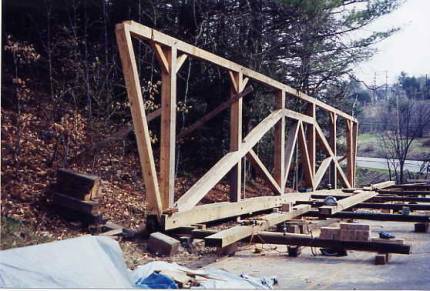 James, J.G., "The Evolution of Wooden Bridge Trusses to 1850," Covered Bridge Topics, National Society for the Preservation of Covered Bridges, Inc., 1997 and 1998. Foliente, G.C. and T.E. McLain, "Design of notched wood beams," Journal of Structural Engineering, Vol. 118, No. 9, 1992, 2407-2420. Minimum Design Loads for Buildings and Other Structures, American Society of Civil Engineers, Reston, VA, 2002. Timber Construction Manual, American Institute of Timber Construction, Wiley-Interscience, 1994. Wood Handbook, U.S. Department of Agriculture, U.S. Forest Service, 1999. Goldstein, E., Timber Construction for Architects and Builders, McGraw-Hill, 1999. Guide Specification for Design of Pedestrian Bridges, AASHTO, 1997. Commentary on the National Design Specifications for Wood Construction, American Forest and Paper Association, 1991. McCormac, J.C., Structural Steel Design, International Textbook Company, Scranton, PA, 1969. Hool, G. A. and W.S. Kinne, Steel and Timber Structures, McGraw-Hill Book Company, Inc., New York, NY, 1924. Graton, M.S. The Last of the Covered Bridge Builders, Plymouth, NH, Clifford-Nicol, Inc., 1990. Fletcher, R. and J.P. Snow, "A History of the Development of Wooden Bridges," American Wooden Bridges, American Society of Civil Engineers, New York, NY, 1976, 29-69. Brungraber, Robert L., Traditional Timber Joinery: A Modern Analysis, Diss. No. 86 02 458, University Microfilms International, Ann Arbor, MI, 1985. Schmidt, Richard J. and Christopher E. Daniels, Design Considerations for Mortise and Tenon Connection, A Report on Research Sponsored by the USDA NRI/CGP Washington, DC and Timber Frame Business Council, Hanover, NH, April 1999. Manual for Condition Evaluation of Bridges, American Association of State Highway and Transportation Officials, 2nd Edition, 1994. "Manual for Bridge Rating through Load Testing," NCHRP Research Results Digest Number 234, NCHRP, 1998. Book of Standards, American Wood Preservers Association, Granbury, TX, 2001. Best Management Practices for the Use of Treated Wood in Aquatic Environments, Western Wood Preservers Institute, Vancouver, WA, 1996. Ritter, M.A. and S.A. Duwadi, Research Accomplishments for Wood Transportation Structures Based on a National Research Needs Assessment, General Technical Report FPL-GTR-105, U.S. Department of Agriculture, U.S. Forest Service, Madison, WI, 1998. Environmental Impact of Preservative-Treated Wood in a Wetland Boardwalk, Research Paper FPL-RP-582, U.S. Department of Agriculture, U.S. Forest Service, Madison, WI, 2000. Morrell, J.J. and R. Rhatigan, "Preservative Movement from Douglas Fir Decking and Timbers Treated with Ammoniacal Copper Zinc Arsenate Using Best Management Practices," Forest Products Journal , 50(2), 2000, 54-58. Brooks, K.M., An Assessment of the Environmental Effects Associated with Bridges Constructed of Wood Preserved with Creosote, Pentachlorophenol or Chromated-Copper-Arsenate, Research Paper FPL-RP-587, U.S. Department of Agriculture, U.S. Forest Service, Madison, WI, 2001. Harp, K.L and S.L. Grove, "Evaluation of Wood and Soil Samples from Copper Naphthenate Treated Utility Poles in Service," Proceedings, American Wood Preservers Association; Vol. 89, 1993, 167-191. Preston, A.F., P.J. Walcheski, P.A. McKaig, and D.D. Nicholas, "Recent Research on Alkylammonium Compounds in the U.S.," Proceedings, American Wood Preservers Association, Vol. 83, 1987, 331-348. Chapman, J.S., M.A. Diehl, K.B. Fearnside, and L.E. Leightly, Anitfungal Mechanism of Dichloro-N-Octylisthiazolone, IRG/WP 98-30183, International Research Group, Stockholm, Sweden, 1998. This section lists books about covered bridges. The books in the first subsection are primarily nontechnical and may have relatively little information of interest to engineers or builders; however, a chapter on references would be remiss in not including this information. A second subsection lists more technical material about covered bridges. A few of the many reference books on timber are included; this list is by no means exhaustive. Some of the articles prepared by early bridge builders also are included, although this material may be difficult to find. A third subsection lists articles related to timber bridges. Most of these articles have been prepared in the past 10 years, with a few older articles interspersed. This list is not exhaustive, but represents those identified as relevant to this manual. A fourth subsection is devoted to other sources of information. Adams, K., Covered Bridges of the West-History and Illustrated Guide, Washington, Oregon, and California, Howell-North Books, Berkeley, CA, 1963. Allen, R., Covered Bridges of the Middle Atlantic States, Stephen Greene Press, Brattleboro, VT, 1959. Allen, R., Covered Bridges of the Middle West, Stephen Greene Press, Brattleboro, VT, 1970. Allen, R., Covered Bridges of the Northeast, Stephen Greene Press, Brattleboro, VT, 1957 (and revised edition 1983). Allen, R., Covered Bridges of the South, Bonanza Books, New York, NY, 1970. Allen, R., Old North Country Bridges. North Country Books, Utica, NY, 1983. Allen, R., Rare Old Covered Bridges of Windsor County, Book Cellar, Brattleboro, VT, 1962. Anderson, S., Guide to the Covered Bridges of New York State, Kingston, NY, 1962. Anderson, S., Ulster County's Old Timbered Crossings, Kingston, NY, 1964. Auvil, M., Covered Bridges of West Virginia, Past and Present, McClain Printing, Parsons, WV, 1973. Baker, J., An Undercover Story: Covered Bridges of California, Chapel Hill Press, Chapel Hill, NC, 2000. Barkman, S., Covered Bridges of Somerset County, Pennsylvania, A-Accurate Printcrafters, Bradenton, PA, 1979. Barna, E., Covered Bridges of Vermont., Countryman Press, Woodstock, VT, 1996. Barton, E., The Covered Bridges of Columbia County, Pennsylvania, Columbia County Historical Society, Bloomsburg, PA, 1962 and 1974. Brandenburg, D. and P. Brandenburg, Kentucky's Covered Bridges, Harvest Press, Cincinnati, KY, 1968. Brydon, N., Of Time, Fire and the River-The Story of New Jersey's Covered Bridges, Essex Falls, NJ, 1971. Caravan, J., American Covered Bridges-A Pictorial History, Courage Books, Philadelphia, PA, 1995. Caruthers, E., Seeing Lancaster County's Covered Bridges, 1974. Chapman, B. and R. Leavitt, 50 Old Bridges of Lebanon, New Hampshire, Lebanon Historical Society, Lebanon, NH, 1975. Cockrell, N. and B. Cockrell, Roofs Over Rivers-A Guide to Oregon's Covered Bridges, Touchstone Press, Beaverton, OR, 1978. Cockrell, N. and B. Cockrell, Roofs Over Rivers-The New Guide to Oregon's Covered Bridges, Oregon Sentinel, Salem, OR, 1989. Cohen, S., West Virginia's Covered Bridges-A Pictorial Heritage, Pictorial Histories, Charleston, WV, 1992. Coldrick, H., New Brunswick's Covered Bridges, Neptune, Saint John, New Brunswick, 1999. Congdon, H., The Covered Bridge, Vermont Books, Middlebury, VT, 1959-1989. "Covered Bridge Festival," The Columbia-Montour Tourist Promotion Agency, 1976. Covered Bridges in the Province de Quebec, Canadian Department of Tourism, Fish, and Game, 1964. "Covered Bridges In Windham County, Vermont," The Brattleboro Daily Reformer and the Vermont Phoenix, 1937. Covered Bridge Pictorial Review, Ashtabula County Historical Society, Vol. 15, 1968. De Vito, M., Connecticut's Old Timbered Crossings, De Vito Enterprises, Warehouse Point, CT, 1964. Dedication Souvenir Booklet of the Covered Bridge at Perkasie, PA, 1959. Eaton, T., The Covered Bridges of Illinois, Edward Brothers, Ann Arbor, MI, 1968. Evans, B. and J. Evans, Pennsylvania's Covered Bridges, University of Pittsburgh, PA, 1993. Georgia's Romantic Bridges, Public Information Office, Georgia Department of Transportation, 1980. Gill, P., "Drive the Road and Bridge the Ford" Highway Bridges of Nineteenth Century, Cumberland County, Cumberland County Historical Society, Carlisle, PA, 1992. Gillis, S. and J. Gillis, No Faster Than A Walk-The Covered Bridges of New Brunswick, Goose Lane Editions, Fredericton, New Brunswick, 1997. Gould, G., Indiana Covered Bridges Thru the Years, Indiana Covered Bridge Society, Indianapolis, IN, 1977. Graton, M., The Building of Zehnder's Holz-Brucke, Clifford-Nicol, Inc., Plymouth, NH, 1980. Graton, M., The Last of the Covered Bridge Builders, Clifford-Nicol, Inc., Plymouth, NH, 1980. Hagerman, R., Covered Bridges of Lamoille County, Hagerman, Morrisville, VT, 1972. Harlow, L., Covered Bridges Can Talk!, Wake-Brook House, Coral Gables, FL, 1963. Harmer, H., Covered Bridges of Harrison County, West Virginia, Educational Foundation, Charleston, WV, 1956. Harrington, L., and R. Harrington, Covered Bridges of Central and Eastern Canada, McGraw-Hill, Toronto, Canada, 1976. Harvey, M., The Covered Bridges of Parke County, Indiana, Wabash Valley Print Company, Montezuma, IN, 1963. Harvey, M., The Covered Bridges of Indiana, Wabash Valley Print Company, Montezuma, IN, 1963-1966. Heisel, B., editor, World Guide to Covered Bridges, National Society for the Preservation of Covered Bridges, Marlboro, MA, 1989. Hendricks, D., Covered Bridges of WBYO Land, Boyertown, PA, 1975. Herrman, W., Spans of Time-Covered Bridges of Delaware County, NY, Delside Press, Delhi, NY, 1974. Historic Highway Bridges In Pennsylvania, Pennsylvania Historical and Museum Commission, Harrisburg, PA, 1986. Historic Highway Bridges of California, California Department of Transportation, Sacramento, CA, 1990. Howard, A., Covered Bridges of Bennington County, Village Press, Unionville, VT, 1997. Howard, A., Covered Bridges of Connecticut., Village Press, Unionville, CT, 1985. Howard, A., Covered Bridges of Massachusetts, Village Press, Unionville, CT, 1978. Howard, A., Covered Bridges of Virginia, Village Press, Unionville, CT, 1999. Jakeman, A., Old Covered Bridges of Maine, Ocean Park, ME, 1980. Jakeman, A., Old Covered Bridges, Stephen Dale Press, Brattleboro, VT, 1935. Kenyon, T. and S. Snow, New Hampshire's Covered Bridges, Wake-Brook House, Sanbornville, NH, 1957. Ketcham, B., Covered Bridges on the Byways of Indiana, Oxford Print Company, Oxford, OH, 1949. Ketcham, B., Covered Bridges on the Byways of Ohio, Oxford Printing Company, Oxford, OH, 1969. Krekeler, B., Covered Bridges Today, Daring Books, Canton, OH, 1989. Lanks, H., Covered Bridges, Covered Bridge Heritage, Jenkintown, PA, 1968. Marshall, R., New Hampshire Covered Bridges-A Link With Our Past., TDS Printing, Nashua, NH, 1994. McKee, B., Historic American Covered Bridges, ASCE Press, New York, NY, 1997. Mead, E., Through Covered Bridges to Concord-A Recollection of the Concord and Claremont Railroad (NH), Stephen Greene Press, Brattleboro, VT, 1970. Miller, P., Timbers of Time-The Existing Covered Bridges of Ulster County,1976, Erpf Cultural Center, Inc., Arkville, NY, 1977. Missouri Mills and Covered Bridges, Missouri Tourism Commission, Jefferson City, MO, 1972. Morely, S., The Covered Bridges of California, University of California Press, Berkeley, CA, 1938. Morse, V., Windham County's Famous Covered Bridges, Book Cellar, Brattleboro, VT, 1960. Nelson, J., Spanning Time, Vermont's Covered Bridges, New England Press, Shelburne, VT, 1997. Nelson, L., A Century of Oregon Covered Bridges 1851-1952, Oregon Historical Society, Portland, OR, 1960. Nelson, L., The Colossus of 1812: An American Engineering Superlative, ASCE Press, New York, NY, 1990. Norman, J., Oregon Covered Bridges-A Study for the 1989-1990 Legislature, Oregon Highway Division, Salem, OR, 1988. O'Grady, P., Replicate: The Rebuilding of the Corbin Covered Bridge in Newport, New Hampshire, Town & Country Reprographics, Inc., Concord, VT, 1998. Pancoast, H. and C. Pancoast, Covered Bridges to Yesterdays, Newark, OH, 1959. Petersen, H., Kissing Bridges, Stephen Greene Press, Brattleboro, VT, 1965. Petersen, H., The Covered Bridge, Thomas Crowell Company, New York, NY, 1950. Petersen, W., Covered Bridges in Iowa, The State Historical Society of Iowa, Iowa City, Iowa 1970. Robertson, E. and D. Robertson, Covered Bridges in the Saco River Valley, Robertson Books, Westbrook, ME, 1993. Sangster, T. and D. Sangstar, Alabama's Covered Bridges, Coffeetable Publications, Montgomery, AL, 1980. Schlotterbeck, S., Covered Bridges of Preble County, Ohio, Preble County Historical Society, Eaton, OH, 1976. Schneider, N., Muskingum River Covered Bridges, Southern Ohio Covered Bridge Association, Inc., Zanesville, OH, 1971. Shank, W., Historic Bridges of Pennsylvania, Second edition, American Canal & Transportation Center, York, PA, 1974. Shank, W., The Amazing Pennsylvania Canals, American Canal & Transportation Center, York, PA, 1975. Sloane, E., American Barns and Covered Bridges, Funk, Inc., New York, NY, 1954. Sloane, E., Our Vanishing Landscape, Funk, Inc., New York, NY, 1955. Smith, E. and M. Horst, Covered Bridges of Pennsylvania, Dutchland, Applied Arts, Akron, PA, 1960. Spargo, J., Covered Wooden Bridges of Bennington County, Bennington Historical Museum and Art Gallery, Bennington, VT, 1953. Surany, A. and L. Fisher, The Covered Bridge, Holiday House, New York, NY, 1967. Swanson, L., Covered Bridges in Illinois, Iowa, and Wisconsin, Moline, IL, 1970. Templeton, N., Vermont's Covered Bridges, Third edition, First Vermont Bank, 1980. Thomas, E.H., Tracking the Crossings of the Yellow Breeches Creek, Cumberland County, PA, Rea-Craft Press, Inc., Foxboro, MA, 1981. Turnbull, M., Some Delaware County Bridges , Delaware County Historical Association, Delhi, NY, 1974. Wagemann, C., Covered Bridges of New England, Tuttle, Rutland, VT, 1952. Wagner, V., Covered Bridges of Pennsylvania, Commonwealth of Pennsylvania Department of Internal Affairs Bulletin, Harrisburg, PA, 1965. Walker, E., Covered Bridge Ramblings in New England, Walker, Contoocook, NH, 1959. Way Back When-Informal Essays from Rush County Oral History, Indiana Junior Historical Society, Indianapolis, IN, 1981. Webber, B. and M. Webber, Oregon Covered Bridges, Expanded Edition, Webb Research Group Publishers, Medford, OR, 1995. Weber, W., The Covered Bridges in Indiana, Northwood Institute, Midland, MI, 1977. Weber, W., The Covered Bridges of Parke County, Indiana, Indiana Covered Bridge Society, Inc., Indianapolis, IN, 1980. Wells, R., Covered Bridges in America, Rudge, New York, NY, 1931. Welt, S., Covered Bridges of Oregon, Mosaic Press, Cincinnati, OH, 1982. White, V., Covered Bridges: Focus on Kentucky, Kentucky Imprints, Berea, KY, 1985. Wiebel, J., Life in the Slow Lane, Reiman Publications, Greendale, WI, 1998. Wood, M., The Covered Bridges of Ohio, Old Trail Printing Company, Columbus, OH, 1993. Zacher, S., The Covered Bridges of Pennsylvania, Pennsylvania Historical and Museum Commission, 1982 and second edition, Harrisburg, PA, 1994. Ziegler, P., Sentinels of Time-Vermont's Covered Bridges, Down East Books, Camden, NJ 1983. Zweifel, K., Covered Bridge Ghost Stories, Al Crane Hill Publishers, Birmingham, AL, 1995. A Design Guide and Commentary-Wood Structures, ASCE Publishing, New York, NY, 1975. American Wooden Bridges, ASCE History and Heritage Committee, ASCE Publishing, New York, NY, 1976. Whipple, S., An Elementary and Practical Treatise on Bridge Building, D. Van Nostrand, New York, NY, 1899. Benson, T., Timberframe, Taunton Press, Newtown, CT, 1999. Breyer, D., K. Fridley, and K. Cobeen, Design of Wood Structures, McGraw-Hill, 1999. Davalos, J., M. Wolcott, B. Dickson, and J. Brokaw, Quality Assurance and Inspection Manual for Timber Bridges, Pennsylvania Department of Transportation, Harrisburg, PA, 1992. DeLony, E., Landmark American Bridges, American Society of Civil Engineers Press, New York, NY, 1993. Donnelly, C., User Friendly Guide to Timber Bridges, University of New Hampshire, 1996. Edwards, L., A Record of the History and Evolution of Early American Bridges, University of Maine Press, Orono, ME, 1959. Freas, A., Evaluation, Maintenance and Upgrading of Wood Structures: A Guide and Commentary, ASCE Publishing, New York, NY, 1982. Hartle, R., W. Amrhein, K. Wilson, D. Baughman, and J. Tkacs, Bridge Inspector's Training Manual 90, FHWA Report PD-91-015, Federal Highway Administration, Washington, DC, 1995. Haupt, H., General Theory of Bridge Construction, D. Appleton & Company, New York, NY, 1851. Haupt, H., Hints on Bridge Construction by an Engineer, 1841. "Improvements to the Lattice Truss," American Railroad Journal , Vol.2, 1840. James, J., "The Evolution of Wooden Bridge Trusses to 1850," Journal of the Institute of Wood Science, 1973. Long, S., Description of Col. Long's Bridges: Together with a Series of Directions to Bridge Builders, J.F. Brown, Concord, NH, 1836. Mackie, B., Notches of All Kinds-A Book of Timber Joinery, Firefly Books, Toronto, Canada, 1998. Madsen, B., Structural Behavior of Timber, Timber Engineering, Ltd., North Vancouver, Canada, 1992. National Design Specification for Wood Construction, American Forest and Paper Association, Washington, DC, 1997. Peale, Charles W., An Essay on Building Wooden Bridges, printed by Francis Bailey, No. 116 High Street, Philadelphia, PA, 1797. Ritter, M., Timber Bridges-Design, Construction, Inspection, and Maintenance, U.S. Department of Agriculture, U.S. Forest Service, Washington, DC, 1992. Scofield, F. and W. O'Brien, Modern Timber Engineering, Southern Pine Association, New Orleans, LA, 1963. Snow, J., Wooden Bridge Construction on the Boston and Maine Railroad, Boston Society of Civil Engineers , Boston, MA,1895. Timber Construction Manual, John Wiley & Sons, New York, NY, 1994. Timber Frame Joinery & Design Workbook, Timber Framer's Guild of North America, 2000. Town, I., A Description of Ithiel Town's Improvements in the Construction of Wood and Iron Bridges, South Converse, New Haven, CT, 1821. Town, I., A Description of Ithiel Town's Improvement in the Principle. Construction, and Practical Execution of Bridges, Roads, Railroads, and Aqueducts, Whether Built Entirely of Wood, or of Cast or Wrought Iron, Hitchcock & Stafford, Printers, New Haven, CT, 1839. Whipple, S., A Work on Bridge Building, H.H.Curtiss, Printer, Utica, NY, 1847. Wood Handbook: Wood as an Engineering Material, U.S. Department of Agriculture, U.S. Forest Service, Washington, DC, 1987. Wood, D., Treatise on the Theory of the Construction of Bridges and Roofs, J. Wiley & Sons, New York, NY, 1873. Avent, R., "Structural Repair of Timber Using Epoxies," Structure, 2000: 39-45. Austin, T., "Caring for a Covered Bridge," ASCE Civil Engineering, Vol. 6, 1991: 44-45. Banasiak, D., "Covered Bridges Enjoy Revised Popularity in Buckeye State," Roads & Bridges, February, 1998: 80-82. Barth, D., "America's Covered Bridges." ASCE Civil Engineering , Vol. 50, 1980: 51-54. Black, T., "America's Covered Bridges: Spanning the Years." American City & County , Vol. 113, 1998: 32-42. Bock, Eugene R., "The Covered Bridge of Indiana." Indiana History Bulletin, March, 1954: 56-63. Brooks, K., "Assessment of the Environmental Effects Associated with Wooden Bridges Preserved with Creosote, Pentachlorophenol, or Chromated Copper Arsenate," Forest Products Laboratory 2000: FPL-RP-587. Bruesch, L.D., "Forest Service Timber Bridge Specifications," ASCE Journal of the Structural Division , Vol. 108, 1982: 2737-2746. Bruesch, L. and A. Pelzner, "Surfacing Treated Decks with Bituminous Materials," USDA Forest Service, 1976. Brungraber, R., R. Gutkowski, W. Kindya, and R. McWilliams, "Timber Bridges: Part of the Solution for Rural America," Transportation Research Record 1106, 4th International Conference on Low Volume Roads, 1987. Calil Jr., C., "Timber Bridges in South America," National Conference on Wood Transportation Structures, October 23-25, Madison, WI. General Technical Report FPL-GTR-94, U.S. Department of Agriculture, U.S. Forest Service,. Madison, WI, 1996: 27-38. "Comeback for Historic Covered Bridge." Public Works Vol. 131, 2000: 34-35. Conwill, J.D., "The Covered Wooden Truss Bridge," Classic Wood Structures, ASCE Task Committee on Classic Wood Structures, 1989: 132-136. "Covered Bridge Restoration through Artifact Research." Public Works, Vol. 120, 1989: 42-44. Crosby, C., "What's So Special About a Covered Bridge?" Keystone Folklore 23, No. 3, 1979: 41- 52. Delony, E., "Historic Bridges: Preservation Challenges." Cultural Resources Management , Vol. 14, 1991. Dishongh, B., J. Smith, F. Castjohn, and J. Carnell, "Proof Loading Closed Timber Bridges," National Conference on Wood Transportation Structures, October 23-25, Madison, WI. General Technical Report FPL-GTR-94. U.S. Department of Agriculture, U.S. Forest Service, Madison, WI, 1996: 455-458. Drafahl, J. and S. Drafahl, "Covering Covered Bridges." Petersen's Photographic Magazine, 18 September 1989: 30-33. Duwadi, S. and M. Ritter, "Research on Timber Bridges and Related Topics," Research Update, Federal Highway Administration, Washington, D.C.,1995. "Timber Bridges in the United States," Public Roads, 60(3): 32-40. 1997. Duwadi, S., M. Ritter, and E. Cesa, "An Overview of the Wood in Transportation Programs in the United States," In: Natterer, J. and J.L. Snadoz, 5th World Conference on Timber Engineering August 17-20, Montreux, Switzerland. Swiss Federal Institute of Technology, Lausanne, Switzerland, Vol. 1, 1998: 32-39. Emerson, R., D. Pollock, J. Kainz, K. Fridley, D. McLean, and R. Ross, "Nondestructive Evaluation Techniques for Timber Bridges," In: Natterer, J. and J.L. Snadoz, 5th World Conference on Timber Engineering, August 17-20, Montreux, Switzerland. Swiss Federal Institute of Technology, Lausanne, Switzerland, Vol. 1, 1998: 670-677. "Engineered Wood for Transportation Structures Workshop Record," Constructed Facilities Center, West Virginia University, Morgantown, WV, 1994. Eslyn, W. and J. Clark, "Wood Bridges-Decay Inspection and Control," Agricultural Handbook, No. 557, October 1979. Fortner, B., "Covered Bridge Correction," ASCE Civil Engineering , April 1999: A2-A5. Fox, W., "An Inside Look at Pennsylvania's Covered Bridges," Pennsylvania, Vol. 23, No. 6, November/December 2000: 16-19. Gasparini, D. and D. Simmons, "American Truss Bridge Connections in the 19th Century. I: 1829-1850," Journal of Performance of Constructed Facilities, Vol. 11, 1997: 119-129. Griggs, Jr. F.E. and A.J. DeLuzio, "Stephen H. Long and Squire Whipple: The First American Structural Engineers," ASCE Journal of Structural Engineering, Vol. 121, 1995: 1352-1361. Gutkowski, R.M. and W.J. McCutcheon, "Comparative Performance of Timber Bridges," ASCE Journal of Structural Engineering , Vol. 113, 1987: 1468-1486. Hurlburt, B., "Basic Evaluation of the Structural Adequacy of Existing Timber Bridges,"
Transportation Research Record , Issue 647, 1977: 6-9. Jackson, D., N. Shanahan, E. Sillin, and V. Marsh, "Saving Historic Bridges," National Trust for Historic Preservation Information Sheet, No. 36, 1984. Jester, T., "Preserving Historic Bridges," Cultural Resources Management , Vol. 15, 1992. Kemp, E.L., "The Artifact as Evidence: The Case for Covered Bridge Research and Restoration," Proceedings, International Bridge Conference, 1989: 335-339. Kemp, E. and J. Hall, "Case Study of Burr Truss Covered Bridge," ASCE Engineering Issues, July 1975: 391-412. Kleppe, O. and E. Aasheim, "Timber Bridges in Nordic Countries," National Conference on Wood Transportation Structures, October 23-25, Madison, WI. General Technical Report FPL-GTR-94, U.S. Department of Agriculture, U.S. Forest Service, Madison, WI, 1996: 10-16. Lewandoski, J., "Wood Truss Highway Bridges in North America: Repair & Strengthening," Proceedings of the Fifth International Conference on Structural Faults and Repairs: Extending the Life of Bridges, Vol. 1, 1993: 217-223. "Long-Range Study of Vermont's Town-Owned Covered Bridges," 11th Annual International Bridge Conference, Pittsburgh, PA, 1994. Marathon, N., "Rural Bridges: An Assessment Based Upon the National Bridge Inventory," Transportation Report, Office of Transportation, USDA, Washington, DC, August, 1989. May, M., "DOT Helps Preserve Ohio's History," Public Works, Vol. 127, 1996: 33-35. McLain, T., L. Soltis, D. Pollock. Jr., and T. Wilkinson, "LRFD for Engineered Wood Structures - Connection Behavioral Equations," ASCE Journal of Structural Engineering, Vol. 119, 1993: 3024-3038. McCutcheon, W. J., R.M. Gutkowski, and R.C. Moody, "Performance and Rehabilitation of Timber Bridges," Transportation Research Record 1053 , 1986: 65-69. Meierhoefer, U.A., "Timber Bridges in Central Europe, Yesterday, Today, Tomorrow." National Conference on Wood Transportation Structures, October 23-25, Madison, WI. General Technical Report FPL-GTR-94, U.S. Department of Agriculture, U.S. Forest Service, Madison, WI, 1996: 22-26. Moody, R.C. and M.A. Ritter, "Wood In Infrastructure: Analysis of Research Needs and Goals," Wood Engineering in the 21st Century: Research Needs and Goals, ASCE, Portland, OR, 1997: 96-108. Muchmore, F.W., "Techniques to Bring New Life to Timber Bridges," ASCE Journal of Structural Engineering, Vol. 110, 1984: 1832-1846. Nowak, A., C. Eamon, and M. Ritter, "Structural Reliability of Plank Decks," Proceedings of the 1999 Structures Congress, Structural Engineering in the 21st Century April, 18-21, 1999: 688-691. Nowak, A. and M. Ritter, "Load and Resistance Factor Design Code for Wood Bridges." Proceedings of 4th International Bridge Engineering Conference; August 28-30, 1995 Vol. 2, 1995: 351-357. Oliva, M., R. Tuomi, and A. Dimakis, "New Ideas for Timber Bridges," Transportation Research Record 1053, 1986: 59-64. Pellerin, R., R. Ross, R. Falk, and N. Volny, "Evaluation of Timber Bridges Using Stress Wave Technology," Pacific Timber Engineering Conference, July 11-15, 1994. Pellerin, R., J. Lavinder, R. Ross, R. Falk, and N. Volny, "In-place Detection of Decay in Timber Bridges - An Application of Stress Wave Technology," National Conference on Wood Transportation Structures, October 23-25, Madison, WI. General Technical Report FPL-GTR-94, U.S. Department of Agriculture, U.S. Forest Service, Madison, WI, 1996: 10-16. Pierce, P., "Covered Bridges-Life-Cycle Cost Advantages?" ASCE Structures Congress XV, 1997. Rammer, D., "Experimental Shear Strength of Glued-Laminated Beams." FPL-RP-527, Forest Products Laboratory, 1994. Rammer, D., R. Soltis, and P. Lebow, "Experimental Shear Strength of Unchecked Solid-Sawn Douglas Fir," FPL-RP-553, Forest Products Laboratory, 1996. Ritter, M., "Current Timber Bridge Research and Development in the United States,"
Forest Products Laboratory, January 20,1993. Ritter, M. and S. Duwadi, "Research Accomplishments for Wood Transportation Structures Based on a National Research Needs Assessment," General Technical Report FPL-GTR-105. U.S. Department of Agriculture, U.S. Forest Service, Madison, WI, 1998. Ritter, M., S. Duwadi, and P. Lee, Eds. 1996. "National Conference on Wood Transportation Structures, October 23-25, Madison, WI." General Technical Report FPL-GTR-94, U.S. Department of Agriculture, U.S. Forest Service, Madison, WI, 1996. Ritter, M., S. Duwadi, and R. Moody, "Development of a Six-Year Research Needs Assessment for Timber Transportation Structures," Forest Products Laboratory, 1993. Ritter, M., R. Moody, and S. Duwadi, "Summary of U.S. Research on Wood Transportation Structures." Proceedings of the International Wood Engineering Conference, October 28-31, New Orleans, LA, Vol. 1, 1996: 81-88. Ritter, M. and A. Nowak, "LRFD Provisions for Wood Bridges." Structures Congress 12. Proceedings of Structures Congress April 24-28, 1994, Atlanta GA, Vol. 1, 1994: 549-554. Ritter, M., T. Wipf, and D. Wood, "Evaluation and Testing of Timber Railroad Bridges." In: Natterer, J.; Snadoz, J.L. 5th World Conference on Timber Engineering, August 17-20, Montreux, Switzerland. Swiss Federal Institute of Technology, Lausanne, Switzerland. Vol. 1, 1998: 670-677. Ritter, M. and K. Stanfill-McMillan, "Wood Bridges in New England," Structures Congress 13, Proceedings of Structures Congress April 2-5,1995, Boston, MA, Vol. 1, 1995:1081-1084. Ritter, M. and T. Williamson, "Maintenance Practices for Wood Bridges," Structures Congress 13. Proceedings of Structures Congress April 2-5,1995, Boston MA, Vol. 1, 1995: 290-293. Rogers, H., "Old Blenheim Covered Bridge," Classic Wood Structures, ASCE Task Committee Classic Wood Structures, 1989: 132-136. Rogers, H., "Reinforcing Historic Covered Bridges." Proceedings, International Bridge Conference, 1987: 87-90. Rogers, H., "Reinforcing Historic Covered Bridges," Public Works ,Vol. 119, 1988: 63-65. Rogers, H. and Montgomery, D., "Historic Bridge Replicated," Public Works , Vol. 123, 1992: 30-33. Ross, R., R. Pellerin, N. Volny, W. Salsig, and R. Falk, "Inspection of Timber Bridges Using Stress Wave Timing Nondestructive Evaluation Tools-A Guide for Use and Interpretation, General Technical Report, FPL-GTR-114,U.S. Forest Service, 1999: 1-15. Ross, R. and R. Pellerin, "Nondestructive Testing for Assessing Wood Members In Structures-A Review," FPL-GTR-70, U.S. Forest Service,1994. Seligman, J., "Reconstruction of a Covered Bridge: Spanning Time." Public Works, Vol. 130, 1999: 60-61. Smith, K. and J. Andrews, "Restoration of Meem's Bottom Covered Bridge." Transportation Research Record Issue 834,1981: 6-11. Smollen, J., "Rehabilitating the Covered Bridges of Ashtabula County," Proceedings of the First Historic Bridges Conference, Ohio Historical Society. Columbus, OH, 1985. Sherman, J., "Last of the Covered Bridge Builders." Historic Preservation, Vol. 38, No. 4, 1986: 20-22. Stanfill-McMillan, K. and J. Kainz, "Factors Influencing Timber Bridge Performance." Structures Congress 13. Proceedings of Structures Congress April 2-5, 1995, Boston, MA, Vol. 1, 1995. "Study In Wood." Bridge Design and Engineering, May 1997: 68-69. "Swiss Will Rebuild an Historic Covered Bridge." Engineering News Record, Vol. 231, 1993: 18. Thomas, W. and J. Puckett, "Analysis, Design, Rating, and Drafting of Wood Bridge Superstructures." National Conference on Wood Transportation Structures, October 23-25, Madison, WI. General Technical Report FPL-GTR-94, U.S. Department of Agriculture, U.S. Forest Service, Madison, WI, 1996: 361-370. Thompson, S., "Bridge to the Past." American City and Country, Vol. 106, 1991: 62-69. Design and Construction, Vol. 6, 2001: 92-94. "Timber Bridge Decks." ASCE Civil Engineering, Vol. 55, 1985: 47-49. "Timber Highway Bridge Construction Practices in the United States." National Conference on Wood Transportation Structures, October 23-25, Madison, WI. General Technical Report FPL-GTR-94, U.S. Department of Agriculture, U.S. Forest Service, Madison, WI, 1996: 1-9. Verna, J., J. Graham, J. Shannon, and P. Sanders, "Timber Bridges: Benefits and Costs." ASCE Journal of the Structural Division, Vol. 110, 1984: 1563-1571. 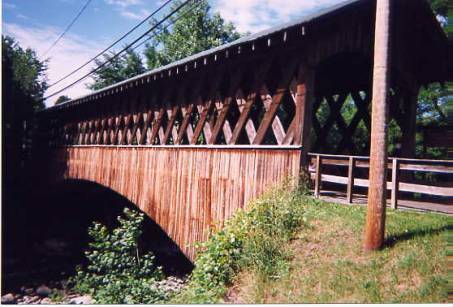 "Vermont's Covered Bridge Study-The Rest of the Story," 14th Annual International Bridge Conference, Pittsburgh, PA, 1997. Wacker, J., S. Catherman, and R. Winnett, "Field Performance of Timber Bridges-12. Christian Hollow Stress-Laminated Box-Beam Bridge," FPL-RP-560, Forest Products Laboratory, 1998. Walter, G., "Timber Bridges in Australia," National Conference on Wood Transportation Structures, October 23-25, Madison, WI. General Technical Report FPL-GTR-94. U.S. Department of Agriculture, U.S. Forest Service, Madison, WI, 1996: 17-21. Structural Division, Vol. 101, 1975: 1-10. Wipf, T., M. Ritter, and D. Wood, "Dynamic Evaluation and Testing of Timber Highway Bridges," Proceedings of the Pacific Timber Engineering Conference, March 14-18, Rotorua, New Zealand. New Zealand Forest Research Institute, Forest Research Bulletin No. 212. Vol. 3, 1999: 333-340. In addition to sources such as State historic preservation offices and the structures unit within a State transportation agency, the most likely sources of additional information are covered bridge societies. A number of societies, including national, statewide, and regional organizations, are devoted to the preservation of covered bridges. There are also organizations devoted to a single covered bridge. Most societies publish periodic newsletters; some also produce supplemental documents. Many societies have access to a wealth of information about the history of individual bridges, but few have specific information that would be helpful to an engineer or builder. Nonetheless, one might benefit by contacting such organizations when doing research about a particular bridge. Ohio Historic Bridge Association Inc. These societies are not permanent, and contact information changes periodically. The above list was current at the time of this manual's publishing.